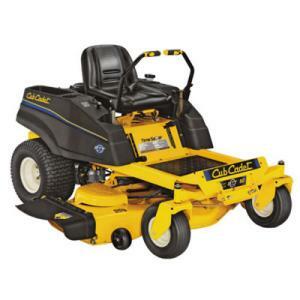 I recently purchased a Cub Cadet 50 in, 22HP Kawasaki Zero Turn Rider. We have used it three times. The mower is exceptional. It has cut the time in half that it takes us to cut our lawn even over our previous riding mower. the only drawbacks have been that the set up was somewhat time consuming. The mower also was a little slower on turns than we were used to. I do however endorse this mower, it is virtually silent and it also is very comfortable to sit on.If I needed to rate this mower, with the somewhat limited use that I have had with it than i would rate it a three on a scale of one to five. I recommend that anyone interested in this mower take a look into some of the additional parts that can be purchased. We regret not purchasing some of the attachments that were offered and have decided to go back and purchase them. Another great feature of this mower is the ability to navigate around all of my flower and garden beds and shrubs. We are able to move over the driveway without any hassle. This was a huge problem with our previous mower and one of the reasons we decided to go with the zero turn technology. This feature is the single most important factor in our purchase. A riding lawn mower is a huge investment. This is definitely the case with the Cub Cadet. It would earn my seal of approval. It is a wonderful machine that will make mowing your lawn as pleasurable of an experience as possible. Could not ask for a better mower,,,,dependable,tough,& flawless cutting ablity.